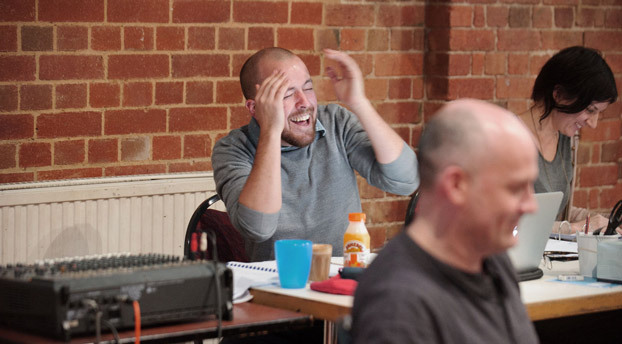 Mark Pritchard, dramaturg for Love and Information, shares his thoughts from the rehearsal room and helps put Churchill's giant jigsaw puzzle together. I'm writing from the Bagging Room, a rehearsal space in the rafters of The Coopers Malthouse, where preparations for Love and Information are firing along. Caryl Churchill, playwright of Love and Information, has written some of the most extraordinary works in the Western cannon – her plays are rich, taught, insightful and potent. Churchill wrote this play at the age of 73. As our creative team unravel it in the rehearsal room, you can feel the breadth of perspective and the depth of understanding that she has collected over decades of trying to articulate the human experience of the contemporary moment. In a page of dialogue, she can bridge complex mathematical theory and a couple on the brink; the beauty of ancient poetry and the clumsiness of words, the brutality of censorship and the subtleties of power play. Each scene is a window into a relationship, a big question and a small moment between two humans trying to make sense of it all. And you can feel all this in the rehearsal room – eight extraordinary actors laughing, debating, crying, brooding, listening, yelling, singing, and trying to make sense of it all in their mouths and in their bodies. It's not often you meet a process that demands this much invention – casting is constantly shifting, there are tables overflowing with props being tried against different scenes, and the building blocks of the set are constantly rearranged like a jigsaw puzzle. The ordering of the scenes is shifting all the time, but as the pieces click into some semblance of order we can start to zoom out and see elegance in the play’s bigger picture. At its heart, Churchill’s fascinating play is charging us to do that essential human thing, the only thing that holds us all together – communication, human to human, working together to create meaning and beauty in a chaotic world. Love and Information, 9 Jul – 15 Aug, Wharf 1 Theatre. Connect. Find more love and information on social media tagging #STCLoveandInfo @sydneytheatreco. We love to hear from you. Join the cast and key creatives for a conversation about the play and the rehearsal process. Tickets are complimentary, but RSVP is essential. Book your free ticket here.